Rugs, weaving workshops, and traditional tools for sale from a Dineh weaver. Handwoven rugs in unique designs including Zapotec made with handspun wool and fine dyes. Offers rag, fleece, and blue jean rugs, portage fluff, and other hand-wovens items. Featuring Persian handmade rugs from the weaving centers of the world, in a variety of sizes and prices ranges. Family-operated business carrying weaving, spinning, and knitting supplies and equipment and household items. Also offering small dye runs of handpainted yarns for weavers and knitters and rovings for spinning and custom weaving. Contemporary and historic navajo rugs and weaving. Other select Native American art. Hand-dyed custom spun yarns of Churro and other wools come in both blanket and rug weights for weaving rugs, tapestries or apparel. Provides a selection of weaving equipment, looms and supplies. Also sells handwoven and handknitted items. For decorators and public to design rugs to meet individual needs and ready made rugs also. Providing handcrafted wool and silk rugs and imported Afghan tribal rugs. Supplies and classes for a variety of crafts including knitting, crochet, tatting, weaving, felting, spinning, basket-weaving, rug hooking, beading and needlework. Modern rugs which are multi functional as tapestries, wall hangings, floor rugs, throw rugs and sleeping mats. Pande Cameron hand knotted rugs, InnerAsias Gangchen Carpets of Tibet, Michaelian and Kholberg area rugs and Mastercraft Imports. Wool, mohair, llama wool, custom woven rugs, roving, batts, hand spun and custom mill spun yarn. Spinning and weaving classes offered. New, used, and antique spinning wheels. Weaving looms, books, supplies, fleeces, spinning fibers, weaving yarns, dyes, videos, jewelry, and sheep. Authentic Andean alpaca rugs and other soft furnishings, including a variety of rugs, pillows, and teddy bears. Antique Persian rugs, semi-antique rugs, rag rugs, kilims, and dhurries. Offers kits, books, cane, bases, embellishments, handles, coiling, pine needle art, gourd weaving, hoops, patterns, raffia, reed, sea grass, shaker tape, stains, dyes, stencils, and weaving tools. Handmade oriental and persian rugs with tribal, antique, and workshop rugs also available. Yarns for weaving and knitting, fleece for spinning and felting, equipment for weaving and spinning. Oriental rugs including antique and new rugs. Hand woven rugs in a variety of sizes and colors. Dealer for contemporary and antique rugs and other Southwest Indian art. If the business hours of Homestead Weaving Studio in may vary on holidays like Valentine’s Day, Washington’s Birthday, St. Patrick’s Day, Easter, Easter eve and Mother’s day. We display standard opening hours and price ranges in our profile site. We recommend to check out homesteadweaver.com/ for further information. 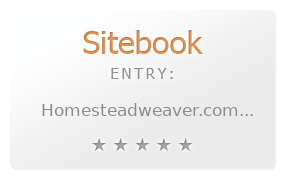 You can also search for Alternatives for homesteadweaver.com/ on our Review Site Sitebook.org All trademarks are the property of their respective owners. If we should delete this entry, please send us a short E-Mail.